(1) The source of sin is Satan’s lies. (2) The solution to sin is Christ’s death. In which will you choose to live? Choose well! In this lesson we consider the Source of sin. Where there is no law, there is no sin (Romans 4:15). We might mistake this to mean that God’s law is the source of sin, because only when a law is made is sin imputed. 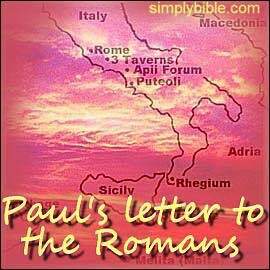 But does Paul say "Until the law sin was NOT in the world"? No, he says, "Until the law sin WAS in the world" (Romans 5:13). An evil exists before a law is made against it. The law does not create the evil. The law condemns the evil already there. The law doesn't make a wrong. It declares and forbids a wrong. Paul goes on to say that God’s law makes sin abound (Romans 5:20). But that does not make it the source of sin. Paul adds that where sin abounds, grace also abounds (Romans 5:20). So if we say God’s law is the source of what it makes abound, we must say God’s law is both the source of grace and the source of sin! That does not make sense. Paul says, "By the law is the knowledge of sin" (Romans 3:20). He explains that later: "Sin through the commandment becomes exceedingly sinful" (Romans 7:13). What was already wrong becomes worse because now it breaks a commandment which made the wrong clear. Shopkeepers put their wares under everybody’s noses to increase sales. But they also increase thefts, so they have signs stating that shoplifting is a crime and offenders will be prosecuted. They may create an opportunity in which theft increases, but they are not the source of the crime. Sin takes opportunity by God’s law, but God’s law is not the source of sin (Romans 7:7-8). Our bodies and their desires are not evil in themselves. Lust is in the heart not in the flesh, and the body is dishonoured by sin (Romans 1:24). Doing what the body is naturally designed for does not lead to sin, but "leaving the natural use" does lead to sin (Romans 1:27). Our fleshly bodies are intended by God to be "instruments of righteousness" which proves that they are not evil (Romans 6:13). An "instrument" —such as an ordinary pen for example— can be used in a variety of ways, as an instrument of good, or as an instrument of evil. It is not itself the source of sin. Sin entered the world through Adam (Romans 5:14,19). He gets the blame although Eve sinned first, because Eve was deceived, but Adam was not deceived (1Timothy 2:14). This does not excuse Eve, but it does lay the blame more fairly and squarely upon Adam, because he sinned when he knew better. So it is said that sin came through Adam. But that is not to say it came from him. If I let a fly into the house, that doesn't make me the source of the fly. Adam was the one who let sin in, but he was not the source. The devil's lies are the source of sin. The fall in the garden of Eden shows us the source. Adam sinned because Eve offered him the forbidden fruit. Eve sinned because the devil told her a lie which she believed. So the sin originated in the devil's lie. People sin when they exchange God’s truth for the deceit of the debased mind of Satan (Romans 1:25,28). Sin is living the lie, and and all sinners are, in that sense, liars (Romans 3:4). Some live the devil’s lie after the manner of Eve. They sin in ignorance, being deceived. Others live the devil’s lie after the manner of Adam. They know full well that they are doing wrong. When we read of the behaviour described in Romans chapter one, we may think, "How horrible! I would never do that!" But they who do such things may be deceived, whereas you may sin in ways that seem less repugnant to you. Yet you know full well that you err. Whose sin is worse? Think about it, and don’t be deceived by Satan. —Did God make a covenant with Adam? If so, did this covenant include both Adam and Eve and their descendants? Did the covenant exist before and after the fall? What was the nature of this covenant? Tap the title above, next to the arrow, to go to that lesson with a link back to this page.